For even the least familiar audience members, Peter Pan represents more than a century’s worth of mainstream revivals, productions, retellings, Disney franchises, and adaptations. Director Joe Wright has decided to join this prolonged tradition, adapting from both of J. M. Barrie’s original texts in his latest film, the appropriately titled Pan. I watched this latest adaptation with a “Peter Pan background” of having skimmed Barrie’s book in days of yore, and having viewed the 1953 Disney classic, the later adaptation Finding Neverland, and far more Disney Tinkerbell spin-offs than I wish to disclose publicly. But despite my familiarity with the subject matter, my expectations were molded more by my adoration of director Joe Wright, who—responsible for the well-conceived Pride & Prejudice (2005), Atonement (2007), and Anna Karenina (2012)—has a skill for literary adaptations that is near unmatched in today’s cinematic landscape. Pan is a departure from these films, in the sense that it doesn’t star Keira Knightley, it isn’t a historical romance, and it was made in 3D. Ultimately this last aspect and other similar aesthetic devices may have been just too much for Wright to maintain his usually cohesive stylistic vision. Even so, at its best Pan conveys the magic and nostalgia of childhood as a dizzying whir of breathtaking visuals. In many iterations of the tale and its characters, Pan becomes a symbol of an unwillingness to grow up–a tendency perhaps most clearly demonstrated in Steven Spielberg’s 1991 adaptation, Hook. But Wright’s Pan is a reminder that our adoption of Peter Pan into pop culture as a hero precisely for his “escaping adulthood” is a purposefully watered-down reading of the character. Boys stolen from their beds in the middle of the night whilst bombs descend on their roofs? This is part of the original J. M. Barrie text, and it eerily conjures Laurence Binyon’s “Ode of Remembrance,” written at the dawn of the first World War: “They shall grow not old, as we that are left grow old: / Age shall not weary them, nor the years condemn.” The only people in our world who don’t get to grow up are those who have died too young. All this said, as Wright begins to drastically diverge from Barrie’s original work, some of his more absurd stylistic preoccupations emerge. 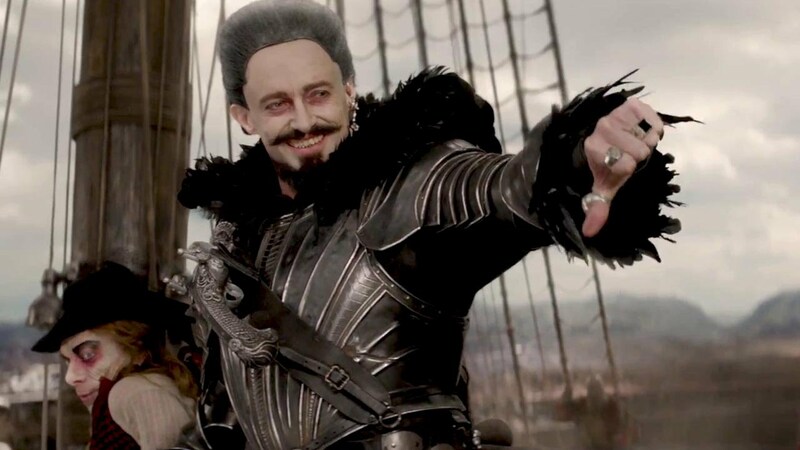 When the new incarnation of Captain Hook, Blackbeard, played by Hugh Jackman, first appears, the pirate is introduced as an Orientalized, ruthless leader, even decked out with a Ho Chi Minh-esque goatee (still jarring despite its seemingly critical intent—as a caricature of caricatures, unlike Rooney Mara’s faux-Native American Tiger Lily). Blackbeard is hailed with a strange, steam-punk chorus-cry of Nirvana’s “Smells Like Teen Spirit.” I still don’t understand that. I mean, I enjoyed it—but I still don’t understand it. In another pitfall, the formulaic children’s film action sequences at the very end feel mismatched with the wonderful, genuinely creative ideas scattered throughout the rest of the film, including other, better, action sequences. Through this formal mix-and-matching, it would appear that Wright has attempted to compose a bittersweet symphony in honor of the fantastical, yet fragile nature of childhood. However, in doing so, some segments feel tellingly slapdash and awkward in their larger context. These narrative fractures are only noticeable because so many of the ideas are expressed with such admirable eloquence, no small feat given the broad amalgam of thematic ideas: youth, death, adventure, foreignness, war, and magic, to name but a few. Yet one could reasonably hold a charitable view of these lapses. In the end it is not only the allusions to dress-up and story-telling that drive home the nostalgic heart of Pan, but indeed the moments that feel like conspicuous missteps. After all, what movie that aims to encapsulate the awkward glory of childhood wouldn’t have a few sequences which feel like they just don’t belong? Written by: Brooke Henzell on December 9, 2015. Last revised by: Double Exposure, our reviewer, on December 13, 2015.